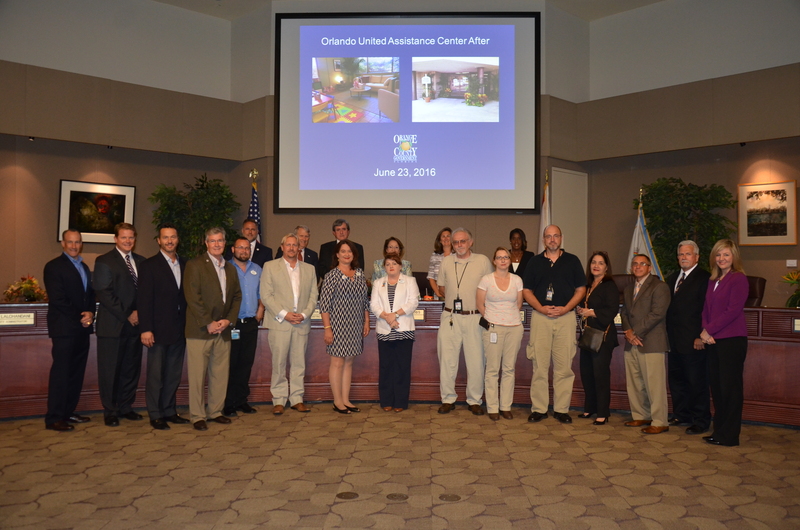 On June 23, 2016, the Orlando United Assistance Center (OUAC) opened its doors to serve those affected by the Pulse nightclub tragedy, but it would not have been possible without the help of the community. Orange County Facilities and Information System Services staff, the City of Orlando, AT&T employees, and Walt Disney World Resort volunteers worked tirelessly to give the facility a much-needed – and impressively speedy – makeover. In less than 48 hours, a formerly vacant Orange County building with dated furniture and bare walls was transformed into the comforting new home for the OUAC. After cleaning carpets, replacing tiles, painting walls, securing the electrical and network infrastructure and decorating, the building is both functional and beautiful. Walt Disney World Resort’s Corporate Citizenship program activated Disney’s Events and Decorating, Scenic Services, Buena Vista Construction Company and Disney Horticulture teams to remodel the building; creating a warm and comforting environment. The Disney crew brought in new furniture, painted the interior of the building, created a Kids Zone filled with Disney toys and cards written by Disney cast members and placed foliage inside and outside of the building. Disney Art Director Richard Szadek selected the paint colors, décor and furniture placement. He designed the vinyl strip on the main reception desk with the words “One Love” repeating across the piece. Szadek knew three people who lost their lives at Pulse. The OUAC is a transition from the first-stage response center, which temporarily operated at Camping World Stadium, to a permanent home for assistance activities such as counseling, navigating mental health needs and economic support. The OUAC is dedicated to providing long-term assistance to those affected by the Pulse shootings, and is modeled after similar operations found to be effective in other communities that have also experienced tremendous loss. It serves as a navigation point for those who need support during this critical juncture and in the future. Culturally experienced representatives from the Hispanic, LGBTQ and Faith communities are present at the center to support families. For more information about the OUAC, please visit cityoforlando.net/hope. To view photos from the OUAC opening visit Mayor Jacob’s Flickr Album.